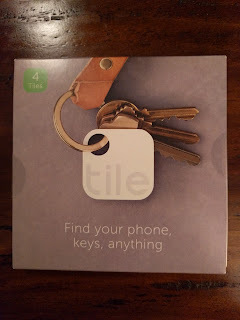 I was lucky enough to be chosen by SproutUp to review the Tile bluetooth tracking tags. Immediately upon openining the package is was impressed. 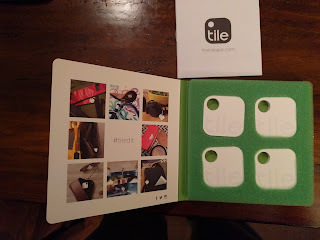 I received a 4 pack of tags that came in a well designed, simple package. The instructions were simple and straightforward. Essentially all you have to do is download the app from the Play Store or the App Store, create an account, activate each Tile tag. The tag itself is extremely well built. The unit is completely sealed making it water-resistant to IP5 Standards. Unlike the Chipolo, which I reviewed here, the Tile does not have a replaceable batter; however it is rated to last 1 year from the time of purchase. 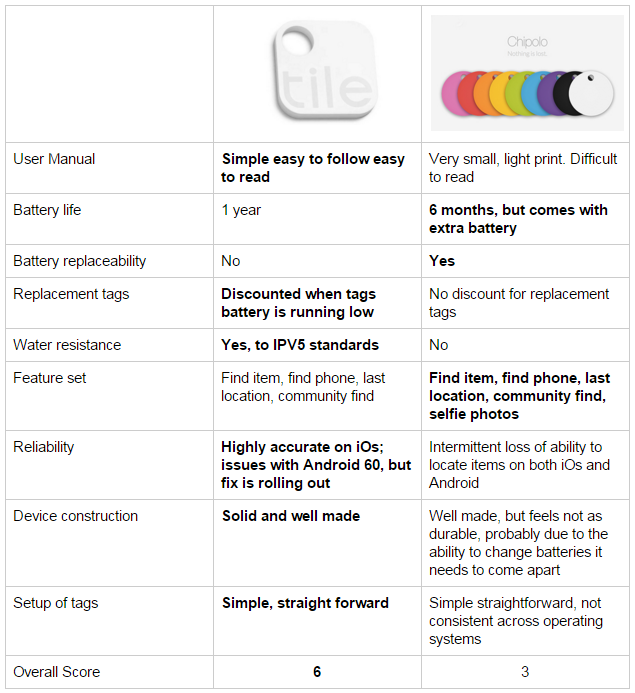 The app will alert you when you are nearing the end of battery life so you can order replacement tags at a discounted price through a program they dubbed reTile. Setting up the tags was a breeze, although I thought I would have issues. The supported device list did not have my Nexus 6P listed, but luckily it worked. To activate the tag, you press and hold the letter E on the tag and then hold it next to your phone, simple as that. Takes all of about 10 seconds for each tag. As with other trackers, the Tile has essentially three main features: 1) Find your item, 2) Find your phone and 3) A community to help find lost items. Finding my items was very simple as the app had three indicators, solid green, dotted green, and grey, depending upon how close the object is to you. You can also view the last known location on the map, but it will give you just a dot where it was, not granular enough to say its in a particular room. If the indicator says you are close enough, but you still cant find your item, just select the tag in the app, and a very loud, but not irritating tone will emanate from the tag making it simple to find. In a similar fashion, if you cant find your phone, assuming it is within range, you can press the letter E twice on any of your activated tags and a loud, yet not irritating tone will emanate from your phone. If the item is not nearby, you have an option to use what they call Community Find. When you activate community find, it essentially has the apps of all other users of Tile begin looking for your tags. The other users cannot see your tags or where they are, just the app reports back and notifies you with a location when your object has been found. They have a great deal of fascinating success stories listed on their website about this. I had some issues with the tags not being found using my Nexus 6P running Android 6.0. Although the tags were in my pocket, they were not able to be found, they couldn't be rung, and they couldn't ring my phone. 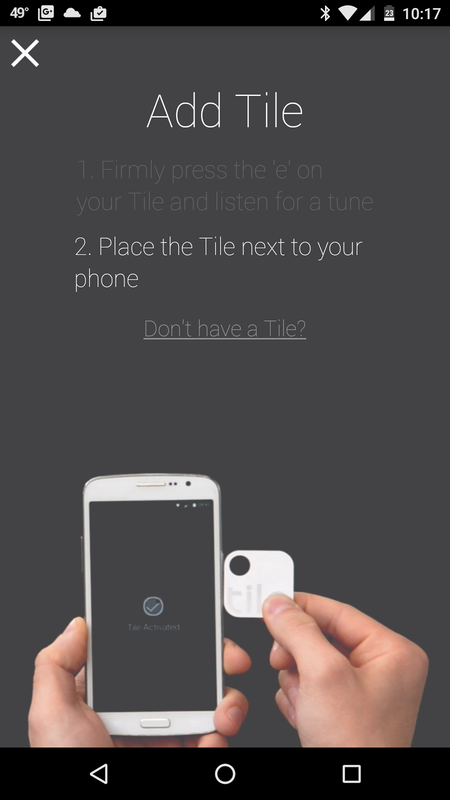 After an extensive chat online with Carlo from Tile Support, we learned that a supposed fix for this issue is forthcoming in the Android OS that is currently rolling out now. So for the meantime, I tested everything out using my iPhone and everything seems to work as expected. Update: Seems Carlo was right, after updating to 6.0.1 I was able to connect to the tags again. I decided to play a great game of hide and seek to test out the Tile in my house and yard. I was confident enough, and brave enough, to give my car keys to my kids. I told them, go hide the keys, first time in the house, on the same floor. Then bolder, I suggested anywhere in the house, basement, attic, second floor, they decide. And then I got even bolder and told them to hide the keys anywhere on our property. All three times, in less than 10 minutes, thankfully, I was able to find my car keys. Below is a video of the kids using the app to find where I put the keys. You can purchase the Tile tags from their webstore starting at $25 for one, and going up in price from there. As I mentioned previously, I also reviewed the Chipolo tags which are very similar devices, so I thought a comparison chart would be worthwhile. Below is a table with key items of consideration and my preference will be noticed in bold. You can see more about the Tile and Sproutup.co here.